For the first time, the National Labor Relations Board (NLRB) has recognized that federal labor law protects workers in the medical marijuana industry. The government authorized a complaint absent settlement of the charges that Wellness Connection of Maine, a medical marijuana company, repeatedly retaliated against and interfered with workers who were exercising their right to form a union. The company subsequently settled charges alleging nearly a dozen instances where Wellness Connection violated the National Labor Relations Act and the rights of its employees. For the first time, the NLRB has recognized that federal labor law protects workers in the medical marijuana industry. The alleged violations began last February, after workers at an Auburn cultivation site organized a walk-out in protest of the company’s unlawful practice of applying pesticides. The federal government was prepared to issue a complaint stating that the company unlawfully disciplined workers who stood together, and interfered with their right to join the UFCW by interrogating them, creating the impression of surveillance, and soliciting them to oppose the union. The NLRB also found merit to the charges that the company maintained several overly broad confidentiality policies that unlawfully prevented employees from discussing their wages and working conditions. Previously, Wellness Connection workers reported other regulatory and health and safety violations to the Department of Health and Human Services, resulting in $18,000 in penalties for more than 20 violations of state law. OSHA also fined Wellness Connection $14,000 for numerous health and safety violations. 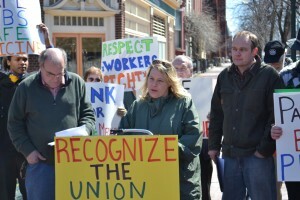 Workers were emboldened to blow the whistle on their employer’s inappropriate practices after joining together in an effort to organize a union. Thousands of medical cannabis workers in six states and the District of Columbia are UFCW members. They work predominantly in dispensaries, coffee shops, bakeries, patient identification centers, hydroponics stores, and growing and training facilities. UFCW members have been key leaders in coalitions and advocacy groups that work for real change at all levels of policy and have been instrumental in working to advocate for the good jobs provided by the medical cannabis industry.